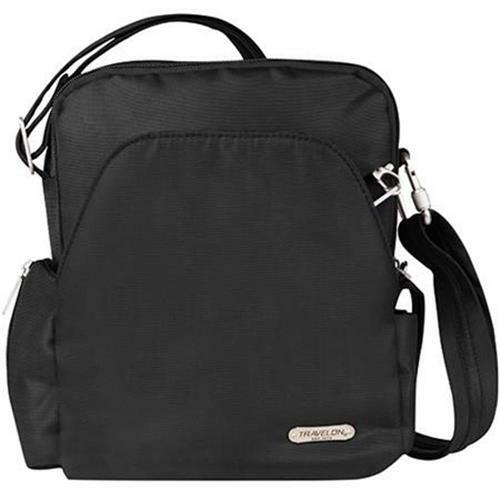 Travelon Anti-Theft Classic Travel Messenger Crossbody Bag RFID Blocking, Locking Zippers. Protect your belongings from pickpockets and slash-and-grab thieves with the Anti-theft Travel Bag from Travelon®. Featuring hidden, slash-proof, Chain Link construction and an adjustable, cable-reinforced, cut-proof shoulder strap. The roomy main compartment features a locking zipper and pockets for organization. The rear organizer is RFID blocking and includes slots for credit cards, and pockets for travel documents. The zippered expansion pocket holds a camera, water bottle, or sunglasses. Size: 8" x 10" x 3.5"
Strap Length: 31" - 56"
Strap Drop Length: 12" - 23"